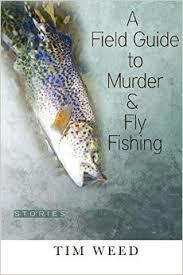 Book Review - A Field Guide to Murder & Fly Fishing: Stories by Tim Weed ~ Ron Samul, M.F.A. A Field Guide to Murder & Fly Fishing: Stories by Tim Weed. Green Writers Press. 2017. 978-0-9974528-7-7 ($24.95) Hardcover. Diving into this collection of short stories by writer and travel expert Tim Weed, you might want to pack your bags and roam the continent in search of great harrowing adventures. And in some ways, this collection delivers on that. But embedded in these narratives, is a deeper longing, a desperate, and sometimes frustrating relationship, between his protagonist’s fraught desires, fears, and dreams. The depth of emotions reveal subtle, dynamic, and often stunning revelations. In stories like “Tower Eight,” “Mouth of the Tropics,” “Diamondback Mountain,” and “Keepers,” Weed moves the physical world to the forefront where nature, mountains, fish, weather conditions, and the reality of nature itself become antagonistic. These stories echo the Hemingway tradition of fronting raw power and natural uncertainty as a means to test a character's fate. This can end in a lesson learned or life lost. But his complexity is not limited to this “surviving nature” theme. Tim Weed’s balance of emotional connection and physical space is always true to the lyrical sense of his prose. At times, the physical locations: Cuba, Grenada, Colorado, the slopes of New Hampshire, Spain, Italy, all play roles in the narratives that balance the emotional depth to the physicality of these locations. Each story hinges on a moment where physical space and emotional connection criss-cross. In “Diamondback Mountain,” a field guide who has fallen for a movie actress finds himself caught up in such emotions it feels like it materializes into a great collapse of his life on the side of the mountain. The balance between falling in love with an actress and the collapse of any kind of his dreams come down on him, catching him in a balance between the physical world and the metaphorical realm that Weed strikes. “Six Feet under the Prairie” connects to the physical and emotional conflict of utility linemen working on the open prairie, fraught with two men at odds with one another, while mourning the loss of the open wilderness for that of suburban development. This harsh and sometimes majestic landscape is constantly fluctuating between a lyrical lesson and a very real and hard-won place in the world. Beyond the natural battles and the lyrical vision of his prose, Weed is at his best when he is pushing the edge of obsessions. His stories connect when we feel the misguided love, the vision of beauty, and the hope that love will follow from one continent to another. In “A Winter Break in Rome,” the narrator (Justin) is obsessed with Kate, another student on winter break in Europe. In the hopes of connecting romantically with her, Justin gets into a fight with local Italian boys and he is beaten for his troubles. In the aftermath, missing a few teeth, there is a deeply moving moment where Justin asks Kate to join him in Greece for the remainder of the trip. Instead of giving him an answer, she says, “Crete should be beautiful this time of year. Also Mykonos. You should definitely go there.” And the dream of being together is dashed in one allusive phrase. His physical beating and now his emotional loss cohabitate across the table. It is desperate, sad, and classically romantic. A Field Guide to Murder & Fly Fishing is more than a collection of adventure stories. It is a significant and moving collection of ideas, snapshots, and visions that leave a lasting impression. Tim Weed’s masterful approach to the opposing forces of his character (nature and emotions) always reveals well-crafted moving stories. It is clear that his experience as a travel expert, educator, and writer has honed his craft to transcend adventure writing to an emotional experience that is timely and deeply moving. Never predictable, this collection is a must for travelers, adventure seekers, and anyone who cares to examine the depth of his varied and flawed characters. Tim Weed is the author of the historical fiction novel Will Poole's Island (2014) and is available in e-book and print format.